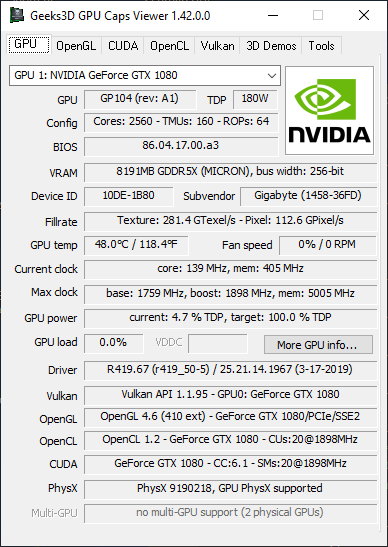 GPU Caps Viewer 1.42.0.0 has been released. on Radeon VII (Vega20 / Vega12 GPUs) - Not tested. + added support of AMD Radeon VII. + added support of Intel UHD 630 (0x3e98). recompilation of GLSL shaders to SPIRV). demo that caused visual artifacts on Intel GPUs. This was reported on previous version as well. I just tried GPU_Caps_Viewer_1.42.0.0 in both Windows editions, zip and installer. Same on both: a small splash screen and then the app dies. I got here because I am trying to track what's wrong with my pyOpenCL installation. In a simple python script, import pyopencl.py is failing. Was hoping GPU_Caps_Viewer_1.42.0.0 could give useful info, but might be failing for the same reason? My dual NVidia GTX 1070 cards are otherwise working fine and I just updated the drivers and all updates of Windows 10 Pro. Check "_log.txt" in program folder. Hey, any update on this by any chance? Thanks for the update on new version (1.42.1.0) but unfortunately, it's still missing the scores for the following tests. So it's only logging 8/14 test results on bench_result.csv. I'll do better in the next update! GPU Caps Viewer 1.42.2.0 has been released. + added support of NVIDIA GeForce GTX 1650. * fixed a minor lighthing bug in the old OpenGL 3 torus demo. * fixed a crash in bench_result.csv for some demos GL 3 and CL demos.
! updated: ZoomGPU 1.23.1 (GPU monitoring library).